【BEST GIFT for Kids & Safe for Kids】3D printer pen is the best gift for kids that helps children to improve spatial and dimensional thinking. And it's also a great way for parents and children to have fun together. 【STRESS RELEASE for Adults & Easy to Use】 Tecboss 3D drawing pen is a great way for adults to relieve stress or cultivate interests. RP500A pla 3d pen is featured with one button control for drawing as easy as writing. 【ADJUSTABLE SPEED CONTROL & Better Experience】The speed control lets you manage the rate of filament flows as you draw. Slow down for trickier type printing.Tip: How fast you pull the pen along while drawing has a big effect on how the plastic comes out cools. 【ENVIRONMENT FRIENDLY & Organic Filament】This 3-d pen is compatible with PLA only. We provide 1 free bundles of PLA filament (random colors). Tecboss PLA Filament is produced from organic substances such as corn and sugarcane. 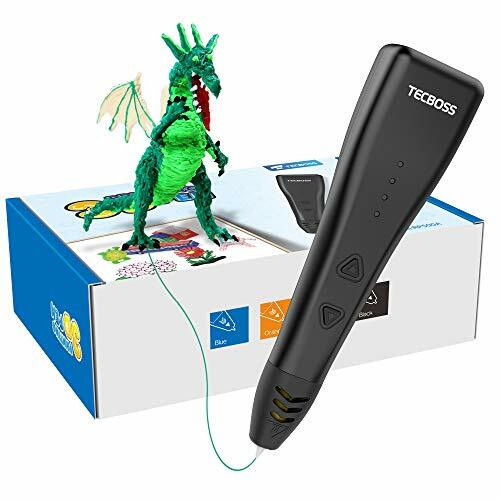 【100% SATISFACTION WARRANTY & Buy 3D pen Get 20%OFF on PLA Fiament】Tecboss 3d pen includes 12 months warranty for replacement. If you buy both 3d pen and 3d filaments by Tecboss, you will get 20% off discount without code.